Rooms with King Beds - complimented in modern decor, color cable TV, direct dial phones, am/fm radio, refrigerator, microwave, iron and ironing board, free wireless internet access. Rooms with 2 Double beds - complimented in modern decor, color cable TV, direct dial phones, am/fm radio, refrigerator, microwave, iron and ironing board, free wireless internet access. Family Suite - (with 2 Double beds and a double sofabed) - complimented in modern decor, color cable TV, direct dial phones, am/fm radio, refrigerator, microwave, tub, iron and ironing board, free wireless internet access. Cancellation Policy is at least 48 hours prior to arrival to avoid one night room charge. blocks on the right at 1650 Lombard. Head north on Hwy 101. Exit at Hwy 101 North & Golden Gate Bridge Exit. Then take the Van Ness Avenue Exit. Follow the signs to Van Ness Avenue. Get into the right lane. 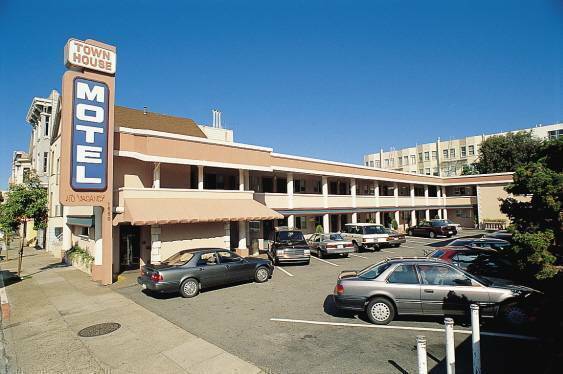 Town House motel is 2 ½ blocks on the right at 1650 Lombard. Continue past the toll booths to the Lombard Street Exit. Continue on Lombard Street for approximately 9 blocks. Turn right on Octavia St. (the street before Octavia is Laguna St.). Go one block, and then turn left. Keep turning left at intersections until you turn left on Lombard St., heading back the way you came in. Town House motel is ½ block down on the right, at 1650 Lombard. For San Francisco Airport transportation, call Super Shuttle at (800) 258-3826.